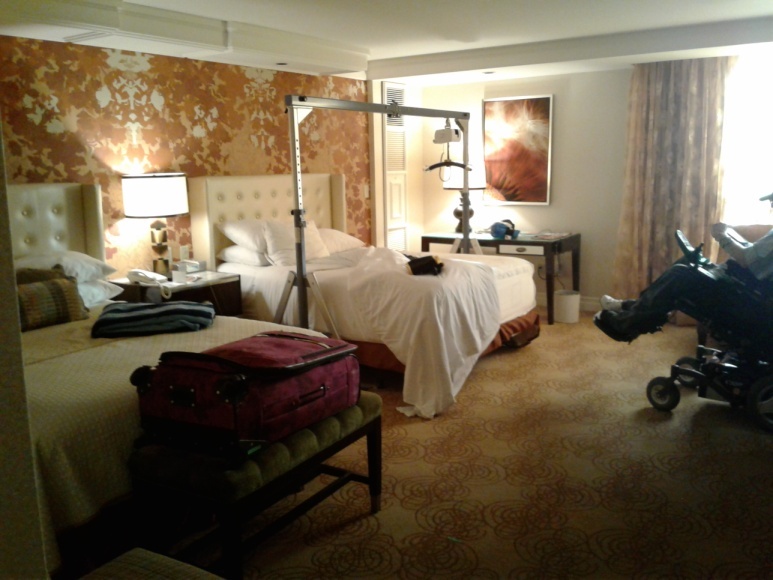 Before I get into the “foodie” side of this article I want to point out a few things about our accessible room at The Bellagio. FANTASTIC! Here are a couple of pics. It was large, roomy, comfortable and so was the bathroom! 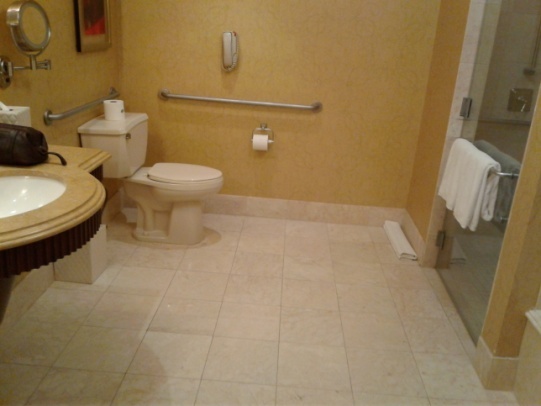 (as always we bring our portable ceiling lift) To the right of the roll in shower is a large bathtub. There are double sinks in the bathroom as well with lots of counter space. 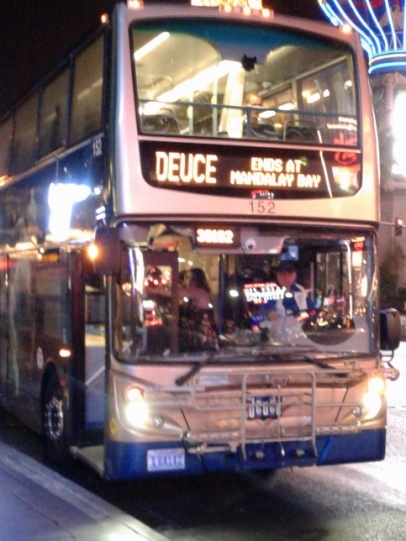 Also have to mention there is a bus called “The Deuce” that has a wheelchair ramp and for $8.00 it will drop you off and pick you up anywhere along the strip for a 24 hour period. Day 1: Upon arrival at The Bellagio while waiting for our room we rolled into the Petrossian Bar, an upscale lounge featuring champagne, caviar, English tea and piano music. We opted for the English Tea and hummus which was presented beautifully. That evening we headed over to what became my favorite meal of the trip at Yellowtail inside the Bellagio. We shared Grilled halibut, unagi (eel) and cucumber, and brussel sprouts. Although the halibut was a very small portion, by the time we were finished we had just enough since we were just looking for something lite. Everything was delicious! 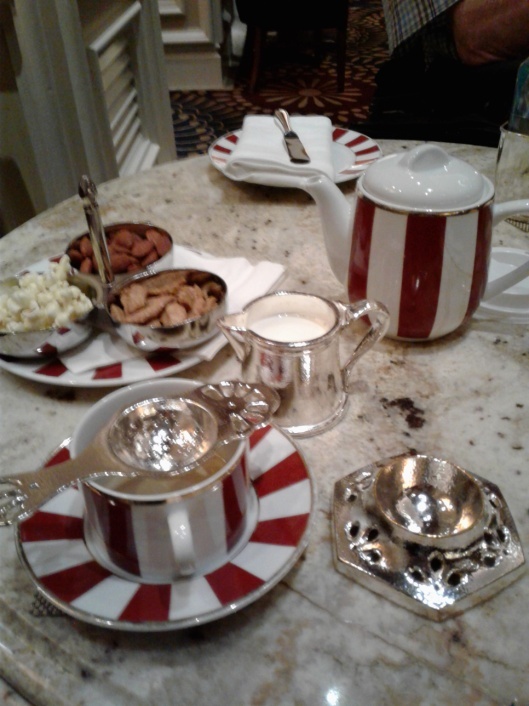 Day2: Went to the “snacks café” at Bellagio for Coffee and egg white fritattas…again excellent but lite. We went back to old Las Vegas (1984-200 or so) before the Riviera was torn down and that side of town was full of action…not so much anymore. The only resemblance was Circus Circus so decided to stop in for lunch at Vince Neils Restaurant (Former Motley Crue Member) It was a bit seedy but man the food was good! I had a turkey burger and my husband had Fried Chicken and I gotta say you just don’t find food this good at these prices in Las Vegas anymore. Gone are the days of 99cent buffets! Or 1.29 steak and eggs! Onto dinner at Ballys for a pulled pork dinner. Again this was reasonable and certainly big enough to share unless you’re STARVING and can eat huge portions. Really good. Husbands Roast Beef Au us? Not a very good cut of beef and very greasy. Day 3: Got up late so decided on brunch. Went to Blondies Sports Bar across the street at the Miracle Mile Shops. Big portions of eggs, sausage, bacon, hashbrowns. Pretty ordinary and so is the price for Las Vegas (about $37.00!) On to Tao Asian Restaurant to use a birthday gift card. Upscale Asian dining at its best! The waitress told us Michelle Obama was there the night before with friends and then headed upstairs to the nightclub afterwards! We shared chicken satay, snapper and asparagus. The chick satay and asparagus both had peanut sauce so needless to say we got our protein in. 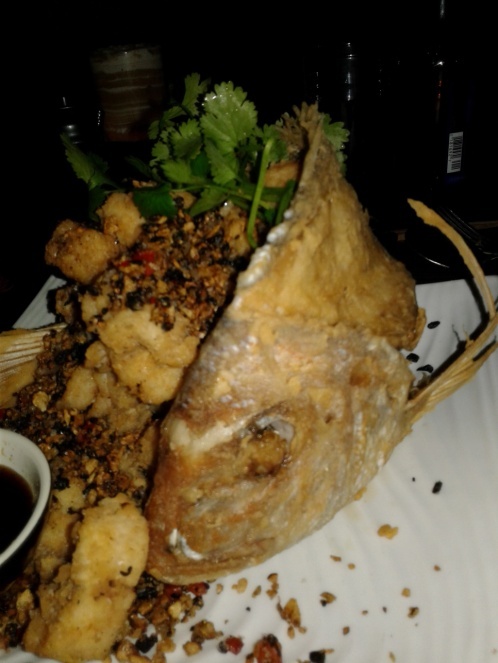 I probably would try something different next time..but the snapper? WAS GOOD. They filet it, deep fry the filets and the shell of the fish and then stuff the shell FULL of all the thick dense fried pieces. Definitely enough for 2. Day 4: Coffee and Muffin at Starbucks. Of course had to take a stroll the Cesars Palace and ended up at Gordon Ramseys Pub and Grill inside for lunch. I had a tomato bisque soup and hummus and had I known the soup was going to come with some delicious crusty cheese bread I wouldn’t have ordered the Hummus and Naan bread..all sooo good. My husband had fish & chips which was a good thick piece of cod but not much seasoning to the batter. Headed down the street to The Cosmopolitan for dinner (where OJ Simpson was spotted the next day according to TV) A very upscale restaurant with an area for private booths or inside main dining room. Due to accessibility we went for the main dining room. I was really in the mood for pasta and this was considered to be a good Italian restaurant. I had spaghetti and my husband had Trout. The spaghetti had a good flavor but would have really liked it with angel hair pasta instead of Spagetti but that is probably a personal preference. The trout was really good but not sure it was worth the $40.00! 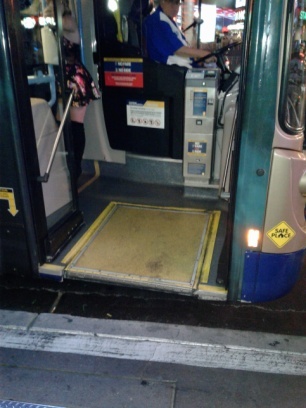 Day 5: Up and heading out to the airport…Ate at Tequilas Mexican Restaurant. I had Taco Salad and my husband had a burger. Taco Salad was really good, Burger not so much..